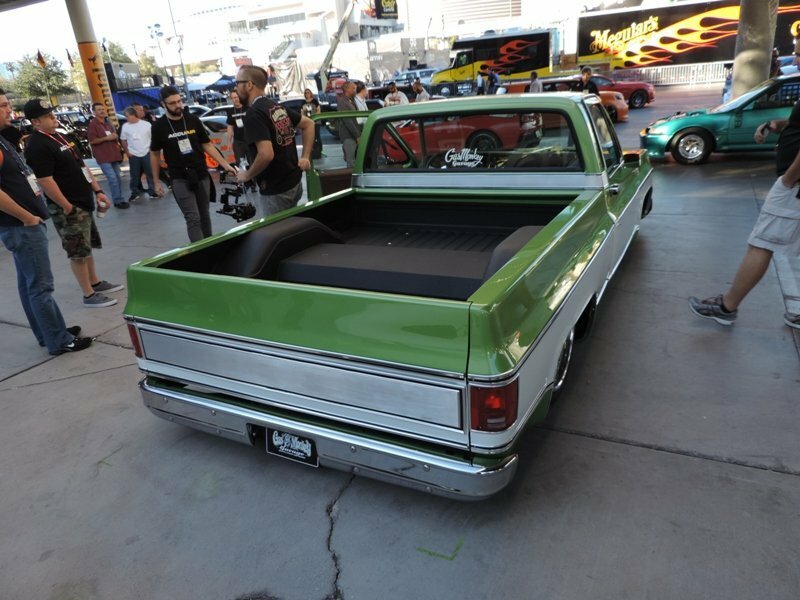 Gas Monkey Garage’s 1976 Chevy C-10 truck is selling at next week’s Barrett-Jackson auction in Scottsdale, Arizona. 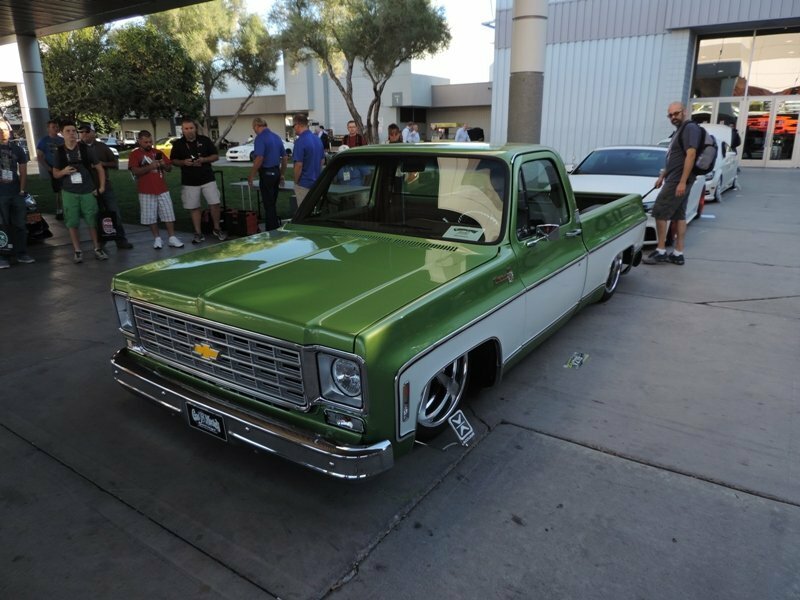 It’s green (of course) and was featured for two episodes of this season’s Fast N’ Loud “reality” TV show on Discovery Channel. 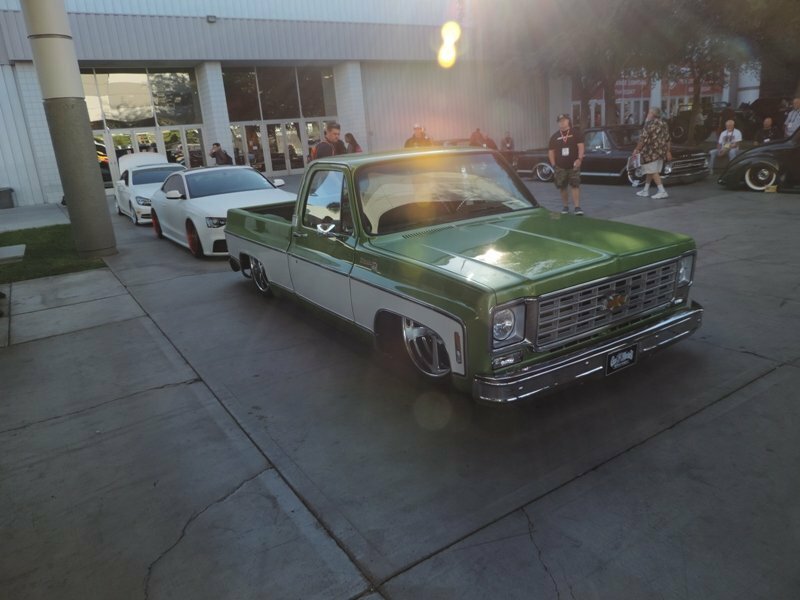 We saw the truck in person for the first time at the 2014 SEMA Show where it was parked out front. It got lots of attention and interest from those who recognized it. 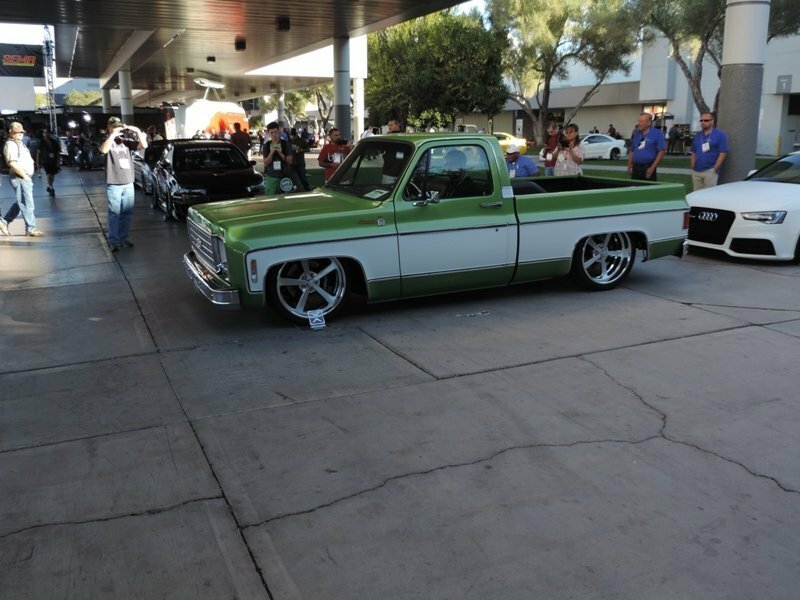 It’s dropped suspension is courtesy of an Accuair Suspension. The folks at Gas Monkey Garage used a crate LS7 engine, which is the stock engine for a Corvette Z06. The used a 4L85E automatic transmission to get power to the Intro Wheels, plus a Currie 9″ rear end. 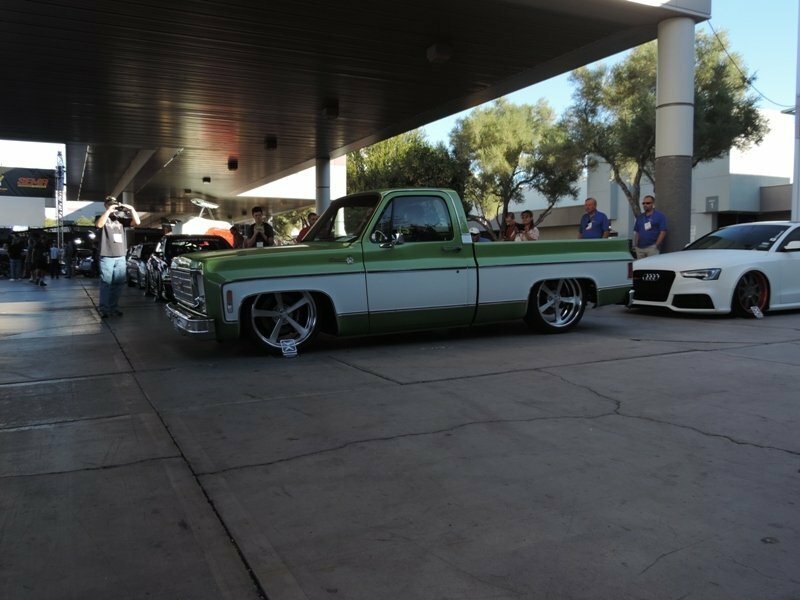 It slows down with Wilwood brakes all around. Got to admit the boys at Gas Monkey Garage know the good name brand parts to throw on a truck or car. Since it was built in Dallas, Texas it also has Vintage air conditioning. You’ll remember the episodes this truck was on. They donated the truck for the high society Cattle Baron’s Ball which was held at the world famous Gilley’s bar. Rawlings figures some rich guy would pony up some serious cash for the truck, but forgot that most guys brought their wives which might have stifled the bidding. 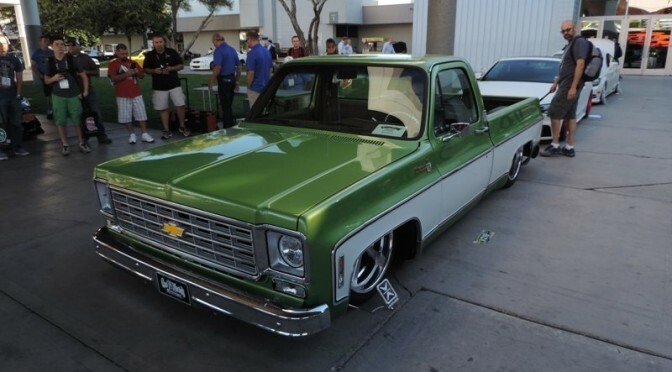 After bidding slowed down on this truck, Richard Rawlings’ friend Dennis Collins (the guy who has his name embroidered on all his shirts) bought it for $85,000. Collins is the guy who brought out the repaired Ferrari to Barrett-Jackson last year. So now it goes on sale at Barrett-Jackson. Dennis Collins snagged a good spot on Saturday at about 1:30 PM so we’ll see if he does any better on this auction sale. And you can bet that the Gas Monkey Garage name will be mentioned often during the bidding. Remember that most of the Barrett-Jackson cars sold are no reserve meaning somebody is taking it home. What do you think the truck will sale for?